Fumi isn’t pleased with her high school life started, thus she informs her best friend Sharna of this. Apparently, Fumi had wanted to enter high school as a large breasted, tall, blonde model. So, Fumi decides that she can have a summer debut and improve her image, thus she needs a boyfriend or four. Sharna isn’t convinced this will be easy, but Fumi believes herself to be cute enough to easily make a boyfriend or two. Sharna doesn’t believe it, so Fumi decides to confess to a guy to prove her point. Hayate is walking by with Nagi, so Fumi snags him, whispering that she wants him to go out with her. Hayate couldn’t hear, so Fumi bails, telling Sharna she had to dump him before he fell for her. Sharna knows it is a lie, so Fumi decides to prove her point by going after Hayate again, this time loudly proclaiming her love for him and her desire to date him. He looks disgusted by this, causing Fumi to demand to know why he’d look at her like she was trash. 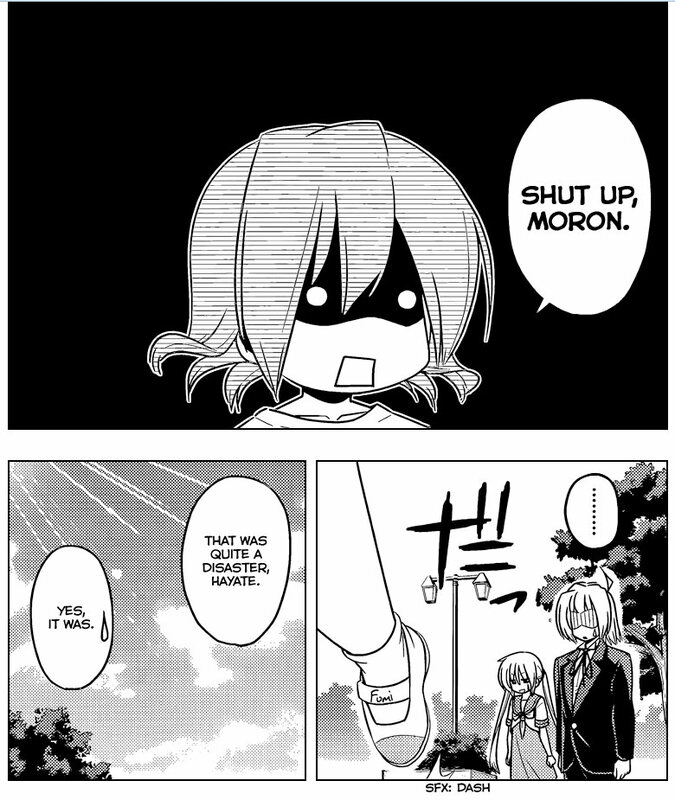 Hayate apologizes and tells her that she shouldn’t say things like that as a joke. Fumi asks how he know, so Hayate tells her that he couldn’t feel any sincerity in her words. He tells her that she should save such things for someone she truly cares for. Her reply is to insult him and walk off. Returning to Sharna, Fumi says that dumping someone is harder than being dumped, but again, Sharna knows it is a lie, having witnessed the whole thing. However, Sharna does tell Fumi that she’s the best as she is and is lovely without a summer debut. Fumi says that her plan is about becoming lovelier, causing Sharna to punish her friend physically. Normally, I love a Fumi chapter, or one where Fumi is involved. Going back to her introduction, Fumi can be so outlandishly funny in her sincere and earnest stupidity, such as her attempt to wake Nagi up by putting bread crumbs on Nagi’s head, then brandishing a hungry bird to complete the task. That was awesome stuff. Here, Hata-sensei makes the mistake of keeping Fumi in super deformed mode for nearly the entire chapter, going for the stupidly, short, dumb, and happy SD look instead of the slender, petite look of her debut (as an aside, the chapter splash page does have Fumi in the slender, petite look), where her SD moments were used for comedy punches only. As such, it isn’t funny. To me, rather than have Fumi make her outlandish debut ideas expressed in a stupid, SD form, it would have been funnier to have her express them in a serious-looking manner, saving the SD moments for the big bang. 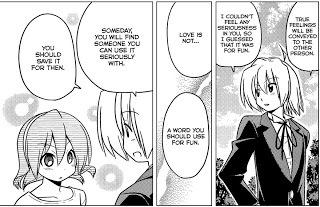 I do think Hata-sensei understands this, as he had Fumi go normal for a brief period of time while Hayate told her she shouldn’t just say she loves someone for the heck of it, after which she insults him. While that is the best moment of the chapter, the zing is lost because Fumi has been in SD mode nearly the entire time prior to that moment. So with a heavy heart, I deem this Fumi chapter (mostly) a failure. Maybe the Japanese think a constant SD Fumi-chan is a riot, but I would not be one of them. Hopefully, the Japanese are with me on this, and Hata-sensei can go back to using SD for its designed purpose — a comedy bang. On to business then. 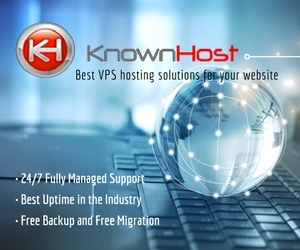 Plans are gradually moving ahead. I should be able to say something specific by the Winter Comiket~~~~ is what I hope…… Seems like I say this every time, but it’s hard to get an original anime picked up. I hope I’ll win the lottery…… (TL: You decide if he means this literally or in terms of getting picked up.) At any rate, it’s certain that this time the novelization will have to come first, but someone else will need to write it. Obviously someone else! Otherwise it’s too much!! Even if I’ve brought this on myself, but come on, you can’t expect me to write almost a small novel’s worth of plot outline!!! For now, I’ll just write a longer than usual outline, OK~~~~! …………And, as usual, there’ll be a GXP volume out early next year. See you in the winter. Lol, even the dude himself knows he’s been saying the I’ll have something specific for you next time line way too many times… Can’t wait to find out what the project with the novelization is about. Smeg! This got trapped in limbo. ^_^;;; When I get the new FAQ up, I’ll have more control over comments. 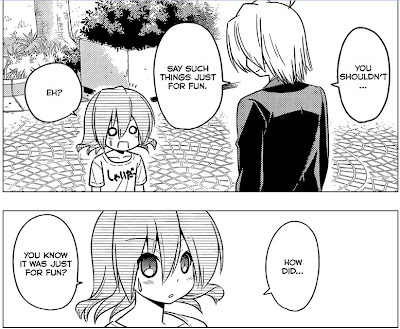 I’m surprised Nagi didn’t get jealous or mad when Fumi confess her love to Hayate. I just noticed, Fumi looks like Ruka. Their hair even looks the same. Yeah, I noticed that too. It happens sometimes in manga where a manga-ka’s characters will sometimes resemble each other. 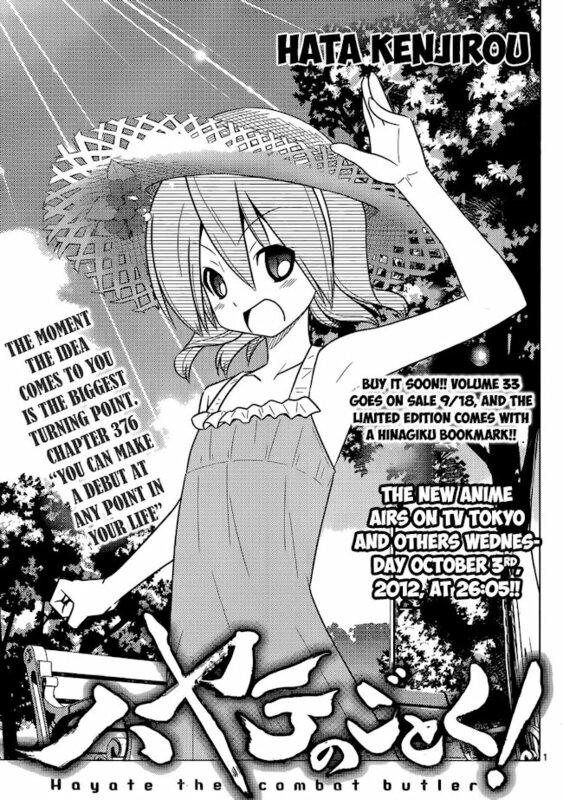 Plus, it doesn’t help that Hata-sensei’s character designs are rather in flux at the moment.